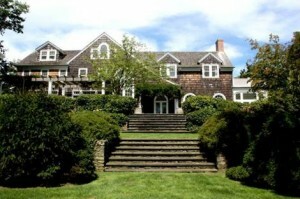 The East Hampton Historical Society is proud to announce their 2013 House & Garden Tour, showcasing some of the finest examples of historic and modern architecture in the Hamptons. This year’s tour – comprised of five unique homes – is scheduled for Saturday, November 30, from 1 to 4:30 p.m.
A kick-off Cocktail Party on the evening of Friday, November 29, welcomes in this year’s highly anticipated House Tour. This annual event, now in its 29th year, is traditionally held over Thanksgiving weekend, ringing in the East End holiday season. Whether you tend toward the charm of a classic, historic East Hampton “cottage” or the clean lines of modern architecture, this year’s tour has an enchanting combination of houses that are sure to delight. “We believe it is the mix of architectural styles – from the turn of the century to today – that gives East Hampton its unique character and flavor,” said Richard Barons, the Executive Director of the East Hampton Historical Society. “Our House Tour Committee has creatively selected five homes that uniquely express the spirit of living by the sea. Different yet complementary, these private homes invite the viewer to take a ramble along the coast to ‘look inside’ some of East Hampton’s most alluring homes,” he added.